Birthdays are special occasions where we commemorate a person’s life. It’s a day to appreciate a person’s goodness, greatness, awesomeness and even their craziness. Not being able to greet friends or family members on their birthday is quite embarrassing. On the other hand, greeting them ahead of time means you remember them and that they are important to you. Here are some birthday greetings and wishes that will serve as your inspiration in greeting your loved ones ahead of their special day. I would like to be one of the people to greet you first. Happy birthday in advance. Just hours away and you’ll be a year older. Greetings from me a few hours before your birthday as I know you are an advanced person. Have a fun birthday! Happy birthday! It’s better to greet you in advance than late. May you have the grandest cake ever. Birthdays are the times when we get to be with our favorite people. I want to greet you in advance and I’m looking forward to joining the party. Happy birthday! I know that you’re birthday is coming so here’s my warmest birthday greeting. I won’t be there but I know you’ll have a blast. Have a wonderful birthday! You’re always here in my heart and through the passage of time, I can say that you are even more beautiful. May you have a long life. Accept my early birthday greeting. Happy birthday! Buddy boy, I know you’ll have an amazing birthday. I’m going to be sad I won’t be there to join the celebration but I’m sending my best wishes. Happy birthday! My friend, you are the coolest person that’s why I’m sending you my birthday wishes a bit early. Happy birthday! Have a blast. Life should be cherished and enjoyed so I’m excited to create wonderful memories with the most wonderful person. Advance happy birthday, my dear! Happy birthday in advance. You are an awesome person because you motivate and inspire people. You’re one of the reasons why this world is a much better place. Enjoy! My dearest, people arrive and stay or go along our journey but we’ve been to0gether for quite a while now. I hope our journey together never ends. Advance happy birthday! Happy birthday, my friend! This greeting may seem early but it’s not expedited so it would be just in time for the celebration. Have a wonderful celebration. Advance happy birthday, my friend! This might be an early greeting but I want you to feel that you are always remembered. I’m sorry I might not be able to join the celebration. I’m so excited for your birthday because I’m celebrating as early as today. Advance happy birthday! Have a good one. I can’t be there on your birthday and I feel sad about it. I want to take this time to greet you a happy birthday in advance. My best friend, a birthday greeting might not be enough for someone as wonderful as you but still I want to send this warm greeting in advance. You are the closest person to me. Enjoy the celebration! They say that we remember the birthdays of the people we are close to. But as your best friend, I always remember your birthday a few days before. Advance happy birthday, bestie! Oh so you’re turning a year older and it’s hard for me to accept that. I would like to send you my greeting before that day arrives. Advance happy birthday, bestie! Advance happy birthday! I want to be the first to greet you for you to know how important you are to me. It might not be obvious but you are. In giving our birthday greetings, sometimes we’re late, just in time or advance. 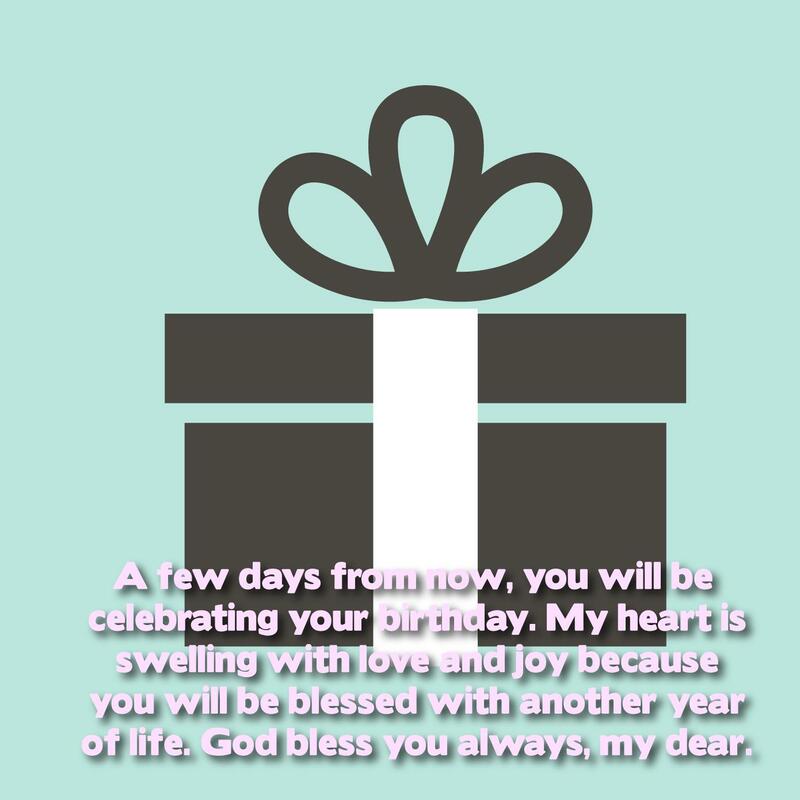 I want to greet you ahead of your special day because you are special. A wonderful birthday to you! You are the person who know me inside out because I tell you everything. Now, I want to tell you something but not my secrets but to greet you a happy birthday. Advance happy birthday! I might not be there during your birthday party but I still want to make you special by greeting you earlier. Advance happy birthday, dear. I might be far away but I hope you can feel how special you are to me. I always care for you. I wish you an advance happy birthday. It’s better to be early in greeting a special someone than being late. Advance happy birthday, my dear! I want your birthday celebration to be more than just one day. I will start now by greeting you a happy birthday days before you’re actual birthday. Advance happy birthday! A greeting card is just one of the things I can give you on your birthday. But I guess it will be more fun if we do the countdown and see who gets to greet you first. Advance happy birthday! How I wish there were not many things to do so I could be there on your birthday. I hope it’s still going to be a fantastic birthday party. Advance happy birthday! Your actual birthdate might not be today. Who cares? We can celebrate it today. Advance happy birthday! Stay cool. I might not be there on your birthday but please know that my spirit is there. Let’s celebrate when I come back. For now, let me greet you happy birthday in advance, my love. It might still be a few days from today, but I already want to greet you a happy birthday. It’s not enough for someone as amazing as you are but at least you know that I remember your special day. Advance happy birthday! I’m sorry that I can’t be there on your birthday but don’t be sad about it. Let’s celebrate it the moment I arrive. Advance happy birthday! 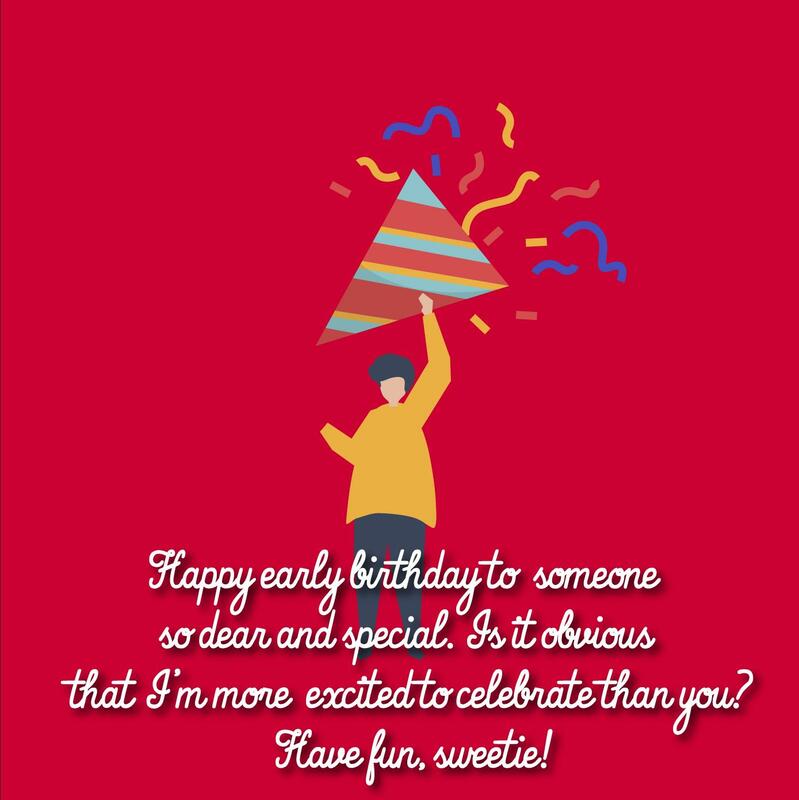 I’m your first in everything so it’s just natural that I’m the first one to send a birthday greeting to you. Advance happy birthday! Enjoy! I might not be there physically on your birthday but I’ll be there in spirit. Remember, the second celebration will be much wonderful because I’ll be there with you. I’ll be ahead of the countdown till D-day comes. Advance happy birthday! I’m sorry about greeting you late last year. To make it up to you, let me start greeting you until your birthday arrives. Happy birthday in advance. Enjoy it! We can celebrate your birthday anytime of the year. We’re such a crazy bunch you know. As long as we’re having fun and sharing wonderful memories, that would be enough. Happy birthday in advance! You are a special person and it’s just right to start celebrating your birthday from today even though it’s still far. Advance happy birthday! Baby, I won’t be there on your birthday but please remember that you’re so special to me. I’m the saddest because I’ll miss the fun and the party and I know you’ll be sad too. To make up for it, I am sending you my birthday greeting in advance. I want to wish a happy birthday from today until the actual birthdate comes. You are my bestie and I want you to feel that you are always remembered. Our friends may remember our birthdays on time but as your birthday, I remember it ahead of time. Happy birthday in advance. Enjoy your party! Some people feel weary when their birthday arrives because that means they’re getting older. I don’t want to add to that burden so I want to greet you ahead of time. Advance happy birthday! I know you deserve more than one simple birthday wish because you’re a wonderful person. I wish that this advance birthday greeting would somehow make you smile knowing it comes from my heart. Happy birthday in advance! I tell everything to you first than anyone else because that’s how much I trust you. So let me be the one to greet you first. Advance happy birthday! I know that your birthday is the time when you want me with you the most but I’m sorry I can’t be there. But I want to ease that sadness by being with you for the rest of the year. Advance happy birthday! You’re so amazing and your birthday should be celebrated not only on the actual date. So I’m giving you free hugs from now until your birthday comes. Advance happy birthday! I regret I won’t be able to join your birthday celebration but it doesn’t mean you’re not special to me. I really wish I could be there. I pray for your happiness, peace of mind and blessings. Advance happy birthday! Your birthday may be a few days away but we can start the party now. You are so special so you deserve it. Advance happy birthday, dear! Your birthday is like a race about the first to greet you. I know I will be the winner. I’m sending you my birthday greeting now. Advance happy birthday, friend! During special moments, I really wish that my life is like a movie so that I can just hit the pause button to be with you. But since that’s just a wish, I want to send you my birthday greeting in advance before I leave for my travels. Your birthday is so near that we can start celebrating today. Let’s not mind the date. Cheers to a beautiful year ahead, my bestie and soul mate. Advance happy birthday! 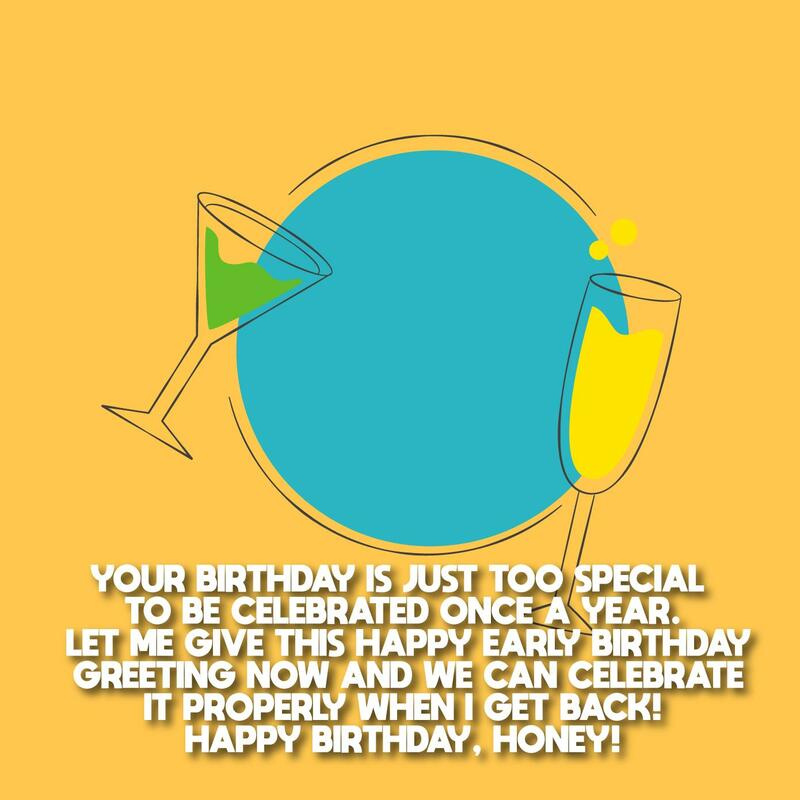 I might be on a trip on your birthday, let me tell you how special you are by sending this advance birthday greeting. I wish I could be there during the celebration but just remember that my thoughts will be with you. Your birthday maybe two days from now but I want to send you my wishes in advance. A warm birthday greeting would not be enough for someone as special as you. Advance happy birthday! My cellphone is ready to remind me of your birthday but I’m going to go ahead and greet you in advance. Advance happy birthday. I wish you the best. I might be late or lazy about many things in life but I am never lazy in greeting my best friend on her birthday. I’m always ahead of everyone. Advance happy birthday, my bestie! Bestie, I might not be there to celebrate with you on your birthday but I am sending this special present which you’ll really like. Wait until I come back. We’ll party until we run out of energy. Advance happy birthday! Most of the time, I tend to forget many things but with you, I always remember special days – in advance. Here’s an advance birthday greeting for you. Enjoy your birthday! I would like to take a leave from work on your special day but since you didn’t offer to pay my monthly dues, I’m working on that day. Sorry I’m going to miss your party. Advance happy birthday! I don’t like to procrastinate so I tend to do things in advance. So here I am greeting you days before your special day. Advance happy birthday! I’m going on a trip so I won’t be there on your special day. But regardless of where I am, whatever I’m doing, I promise that I’ll toast a drink once the clock turns 12. Advance happy birthday, my special friend! Everyone might send you birthday greetings on your special day but I, your best friend, will be the only one to make you feel even more special by celebrating it before your actual birthdate. Advance happy birthday, bestie! The day that you started existing on earth is only a couple of hours away. You have blessed us with your presence and I can’t stop myself from greeting you ahead of time. Advance happy birthday! I tend to be late about many things but I could never forgive myself if I fail to remember your birthday. So here I am wishing you a fun birthday in advance. Enjoy your celebration! I feel so excited about your upcoming birthday that it doesn’t make me sleep at all. Since it’s only a couple of hours away, let me greet you a happy birthday. I wish you all the wonderful things this world can offer. I’m always on time in greeting you a happy birthday. The rest of the things can wait, which means you are so important to me. Happy birthday in advance! You are a wonderful person and once is not enough to greet you a happy birthday. We’ll start the birthday greeting and wishes from today until your special day. Other people might always send you their birthday greeting on time. As for me, I choose to be ahead of them because I want you to feel you’re special to me. Advance happy birthday! Superstitious people believe that we shouldn’t celebrate our birthdays every year. They say that if we celebrate more birthdays then we are closer to our death. Anyway, I would still want to greet you advance happy birthday! They say it’s a waste of money to have birthday celebrations. It means that you still get older but you could save much money. Whether there’s a celebration or not, advance happy birthday! Celebrate your birthday while you’re still able to do so. As the years go by, you might not have the strength to blow your candles on the cake. Advance happy birthday! We might try to hide our real age but sad to say the wrinkles on our face don’t lie. Just be grateful that you’re blessed with long life. Advance happy birthday! We might get a year older on our birthdays but every year is a chance to be wiser than a year ago. Strive to be wider and better. Advance happy birthday! We’re doing to the countdown till your birthday comes. By then, you’re not part of the young generation anymore. Cheers! You can now be called an oldie but goodie. I guess this is the time when your tummy is bigger than your cake. Also, there are more candles on your cake than your hair. Still, be of good cheer. Let’s celebrate another year in your life. Advance happy birthday! You’ve always made me feel special. So today, I would like you to feel very special. Advance happy birthday, daring. I dearly love you. I’m so grateful that you were born in this world because if you weren’t, you wouldn’t be in my world too. Because of that, your birthday is so special for me too! Advance happy birthday, love! Just one day is not enough to celebrate your awesomeness. That’s the reason why I’ve started sending you my wishes a few days before your birthday. Happy birthday, love! I wish I could put all my love in a very big box to know how much I care for you. Well, you know how big my heart is for you. Advance happy birthday! The greatest thing in my life was when I was given the chance to be with you until we grow old. I’m the luckiest person in the universe. Advance happy birthday! If there was a show on how God created the universe perfectly, you would be the perfect performer and the star. Advance happy birthday, honey! You’ve started a spark in my heart. I wish that you would turn that spark into a fire just like how you blow the candles on your birthday cake. Advance happy birthday! It’s not only you who grows a year older every year, I also grow older every year with you, my love. Advance happy birthday! I’m always present in all your birthdays. I can’t imagine missing one birthday in the future and without greeting you first. Happy birthday in advance, my love. Wherever you are, whether by my side or far away, I’ll always see to it that I get to greet you first because you’re the best friend that I have. I wish you an advance happy birthday! Your good friends might greet you on your actual birthday but a great friend like me choose to send you birthday wishes in advance. I guess the difference is obvious now. Advance happy birthday! Advance happy birthday to the greatest friend in the universe. You make my days brighter, more fun and meaningful. Thank you! Enjoy! Our relationship as friends is like a pact and that is forever. I want you to know that I intend to keep that promise. I’m not tired of greeting you advance happy birthday! I might not be able to give you the most wonderful gift, but I can give you my love, respect and care as a true friend. You’re in my thoughts all the time. Advance happy birthday! Let’s celebrate your birthday ahead of the actual date. We’re excited to greet you in advance. I hope our partying may not be too much. Now is the perfect time to send my birthday greeting. I might forget it if I do it later. May God give you overflowing blessings in all the areas of your life. Happy birthday, my brother! Every year, people grow and change. But I wish that there is something that could stop you from growing. I like the way you are now. You are so cute. Advance happy birthday! It’s so unfortunate that I can’t be there to join your birthday celebration but let’s not spoil your birthday. We can celebrate it early. Advance happy birthday! Since you are dearly loved by us, let’s take this chance to have a birthday celebration even though it’s quite early. We cherish each moment we spend with you. Happy birthday! Since I’m your first love, your one and only husband and the most handsome man it’s a privilege to be the first in greeting you a happy birthday. I know that this year will be a good one for you. I love you, sweetheart! Advance happy birthday! You’re my prettiest friend and I can’t help but greet you ahead. May your birthday be filled with happiness and wonderful moments. God bless you always. We’re not sure about what’s going to happen tomorrow. So let’s enjoy today by celebrating your birthday even though it’s a few days away. Let’s have wild birthday party! Happy birthday in advance. Remember that I am always here for you every time you need me. I’m sorry I can’t join your birthday celebration. Please receive these warm early birthday greeting and wishes. Just think that I’m just there. Happy birthday! It’s going to be your birthday soon. I’m grateful and happy because you choose to stay with me even though we’ve experienced many difficulties and challenges in our relationship. Advance happy birthday. You’re my angel. Here’s an early greeting for the most amazing birthday celebrator. I pray that you’re birthday celebration will be filled with fun and happy moments. May this year be a fruitful one for you. I wish employers would consider giving us a rest day on special occasions like a best friend’s birthday. Too sad that doesn’t happen. I might not be there on your special day but let me greet you an advance happy birthday! I find you so cute and adorable and because of that, I want to send you an early warm birthday greeting. Be thankful for all the blessings. May this year be the best for you. Let’s have this early birthday party and combine it with the actual birthday party and the party after that. Wow! That would be the biggest event this year. Are you getting ready for that? I would like to greet an early happy birthday. Receive my wishes, love and appreciation. Please leave me some cake. To my favorite friend, there was never a time I forgot about your birthday. So, today receive my early birthday wish. Have a blessed birthday! There are truckloads of cute little things, barrels of happiness and a lot more that I’m sending to you now. They’re coming all the way from me to you. I’m sending them to you so they’ll reach just in time for your birthday tomorrow. I would like to be there in time for your special day but it’s unfortunate that I can’t be. Don’t worry, let’s enjoy what’s left of the celebration. But as of now, I’m sending my early birthday greeting. I pray that your birthday celebration will give you wonderful moments to cherish and great times. May this advance greeting also bring joy to you. Advance happy birthday! Sending birthday wishes ahead of everyone is one of the coolest things I can do. I guess it’s safe to say that I’m a cool person. Happy birthday in advance! Birthdays are the best times to look back and thank God for all the blessings throughout the year and for praying to have another wonderful year with me. Advance happy birthday! There are different kinds of sending birthday wishes. Some are from the ones you love, family or friends and some come early or late. Since your birthday doesn’t come until next week, you know this is an advance birthday greeting. You’re a dear friend and I know you understand why my birthday wishes come very early. Just remember that you are so special have a wonderful time on your special day. You have been a great coworker and the office is more fun with you. I want to tell you how I value every moment we share together. Let me be the first one to greet you a happy birthday! Celebrating your birthday is something we are excited about. I know it will be filled with music, food, friends and merriment. We’re going to create wonderful memories. Advance happy birthday! Since you understand all of me, I know that I can call you my best friend. And I know that you understand why I would like to send you my birthday wishes in advance. Happy birthday! My friend, it’s a bit unfortunate that I can’t be there to attend your birthday celebration. Here my early birthday greeting for you. Just imagine that I’m just in the room partying with the rest of the people. You’re someone I could celebrate every day. You’re so special and even though your birthday is still a few days from now, I would like to greet you ahead of everybody. Continue to grow and live well. You have a special place in my heart and that’s the reason why I can’t help wishing you a happy birthday in advance. I can even greet you every time as I can. Have a wonderful birthday! People usually send their greetings on the actual birthday but you and I are not like them. To one of my greatest friends, let this serve as an early birthday greeting. I hope that best for you on your birthday onwards. If I had the chance, would spend your birthday by celebrating it the whole day. But it’s unfortunate that I can’t do that this year. 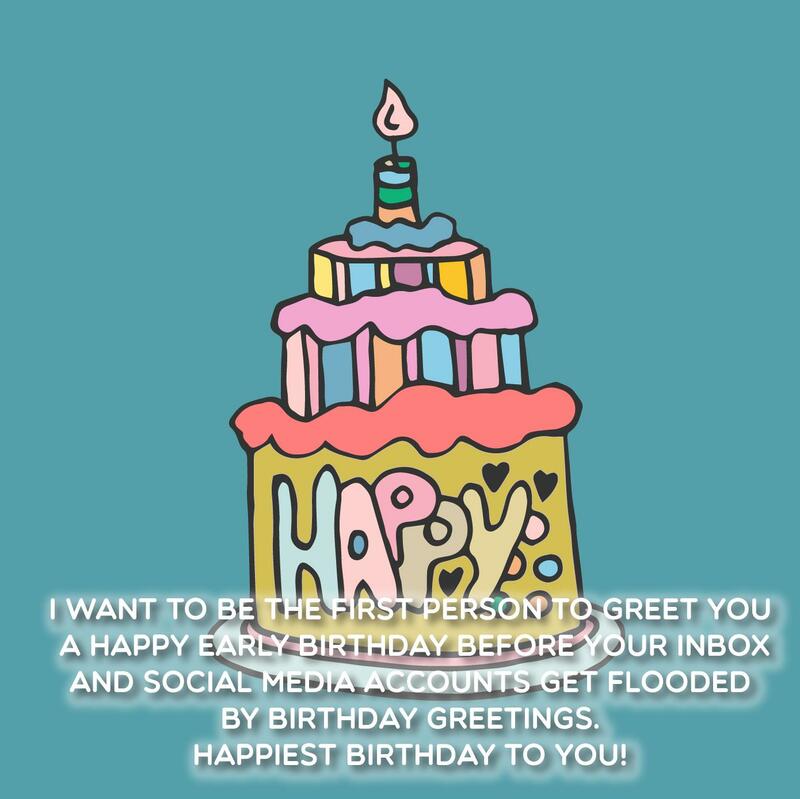 I hope you’ll receive this early birthday greeting. I would like to see you the happiest on your special day. There might be many ways to greet someone a happy birthday. Mine is to greet you way ahead of the others. It’s just the start of more greetings and wishes. Advance happy birthday! Advance happy birthday, dear friend. That will be the most special day this year. I know that this will happen because that’s what I’ve wished for. Believe me, you’re to have a great party. Enjoy the fun and cherish each moment. As your birthday approaches, my wish is for you to have an amazing life filled with wisdom, achievements and good health. Advance happy birthday, my friend. Always be happy. May you receive peace that passes understanding, happiness that doesn’t end, motivation that doesn’t die and joy that is real especially on your birthday tomorrow. Advance happy birthday! Your birthday comes just once a year but someone as valuable as you should have a birthday celebration daily. There’s no one who can compare to your kindness. Advance happy birthday! Advance happy birthday, buddy boy. I know you don’t like cheesy words and corny greetings but I have to do this. I’m not going to be there to join the party but I’ll never miss sending you my wishes and love. I hope that this year will be a good one for you. Have fun! Since it’s been a long time we’ve been good friends, let me continue our tradition of sending early birthday greeting. Advance happy birthday! I pray that as your birthday draws near, it will be the start of a better life, free from all the difficulties and challenges. 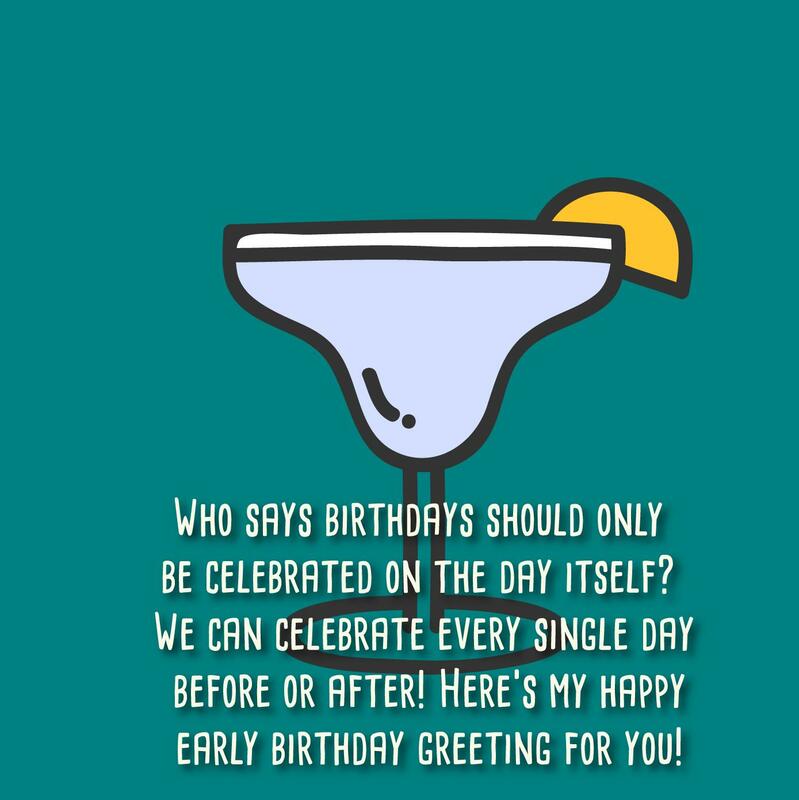 I may not be there to join the party but I’m sending you this birthday greeting ahead. Advance happy birthday to a person who is an early riser. I guess you might have woken up first before receiving this birthday wish. Have fun on your special day! I’ve got your back all the time, in all places. Here’s an advance birthday greeting to start your series of celebrations. Have a blast! The thing that has kept bugging my mind is your upcoming birthday. It’s unlucky that I can’t be there but I want to wish you great blessings from your birthday onwards. Happy birthday in advance! My feelings for you are so great that I can’t wait until your special day arrives to greet you. I pray that you will receive all the great things life can give you advance happy birthday! Enjoy! It’s my tradition to send my advance birthday greetings to the special people in my life. You are one of them. Advance happy birthday. Have a wonderful time. Advance happy birthday! From today, we can already start celebrating your birthday and it’s just the first among the many. I know you love excitement and anticipation but we can’t wait till your special day. Let’s enjoy the chance today. The countdown already began and today is just a week till your birthday. I have prepared some packages for you and will start sending them today. I can’t forget the wonderful and memorable celebration of your birthday a year ago. Your birthday is near and I know that this birthday will be twice more fun and wonderful. Happy birthday in advance. Let’s have a blast! You are just so amazing to celebrate your birthday once. Let’s start the celebration today until the actual date comes. Advance happy birthday! I really want to be there on your special day tomorrow but it’s unfortunate that I can’t. To make it up to you, let me greet you an early happy birthday. I hope your day will be wonderful and may all that you have dreamed of will come to reality. I might not be there with you on your special day, so I guess it’s time to send you my birthday greetings. I pray that you’re going to have a wonderful birthday you can never forget. May your life be overflowing with blessings. All these wishes come from my heart. It’s so sad that I’m going to miss the most awaited birthday party of the town. I know how fun it would be knowing you love to have crazy parties. Anyway, the most important thing is you’ll enjoy it with everyone you love. Get drunk for me. Advance happy birthday! True friends don’t only greet you once on your special day but they start pouring out their wishes as your birthday draws near. This is the start of the series of wishes. Advance happy birthday! Casual friends can remember their friends’ birthday on the actual date. But we’re not just usual friends. We’re best friends so I want to greet you in advance. Happy birthday! Stay happy and healthy. I have never forgotten to greet you during your birthday. This time, I’ll make it more special by greeting you in advance. Happy birthday, my friend. God bless you! I would like to greet you advance happy birthday. May this year be awesome and fantastic for you. This is an advance greeting because I won’t be able to celebrate with you. Just save me a piece of cake. My strength, power, time and affection are for giving you wishes on your birthday. May you have a long and prosperous life. Advance happy birthday! Advance happy birthday, dear friend. There are many goals you want to achieve and wishes you want to happen. I pray that they will come true this year and that you will have the grandest birthday celebration. Have a blast! I wanted to send my birthday greeting on your birthday but nothing can stop me from doing so. I guess I’m just excited. It’s so I won’t forget it. Have fun! You are such an amazing person so this birthday greeting is amazingly early. You deserve to have an amazing year. Have fun! My friend, you are one of the greatest people I know and I wish you could show everyone how it is to live virtuous life. I hope you’ll enjoy the party. Advance happy birthday! I hate myself for being so excited to greet you this early. I wish that you would fell more blessed, loved and cared for today and every day. Have a wonderful birthday! Dear friend, I know how adventurous you are in celebrating your birthday. 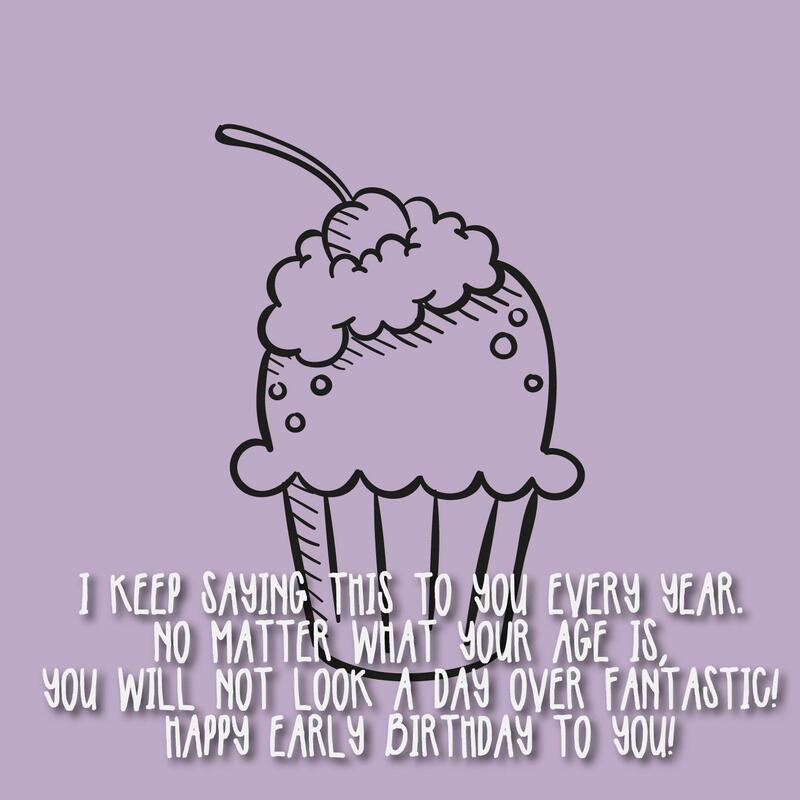 But before everything gets crazy, let me send you this early birthday greeting. Stay cool! Advance happy birthday! You are an amazing person and you deserve blessings, good fortune and happy times. I pray for the best for you. Life is sometimes unpredictable like how unpredictable my schedule is. I won’t be there to celebrate your birthday but I hope this early birthday greeting will make you happy. Happy birthday, dear friend! You are someone who is so amazing so accept this amazing early birthday greeting. Have a blast! Advance happy birthday, dear friend. Don’t worry about my absence on your special day. Let me greet you in advance to make it up to you. Enjoy! I’m sorry to break this news, I won’t be there during your birthday celebration. But, please accept my early birthday greeting. I know your party will be a blast. Advance happy birthday, friend. This greeting might come early but rules are there for us to break. Have a great one! This early birthday greeting serves as a proof that I’m so excited to celebrate your birthday with you. Advance happy birthday! My friend, don’t be sad that I can’t be there on your birthday party because I know you’ll still have a blast. Advance happy birthday! Happy birthday, dear. I can’t join your birthday party but let me send this birthday greeting in advance. Have fun! You know how often I break the rules. So this early birthday greeting is one of them. Have fun! My friend, you are incredible so you deserve to have a grand birthday celebration. Advance happy birthday. I wish this early greeting will make you smile. This is an early birthday greeting to the coolest person in my life. I’m sorry I can’t be there to celebrate but I would like to be the first one to send you my wishes. I love you! 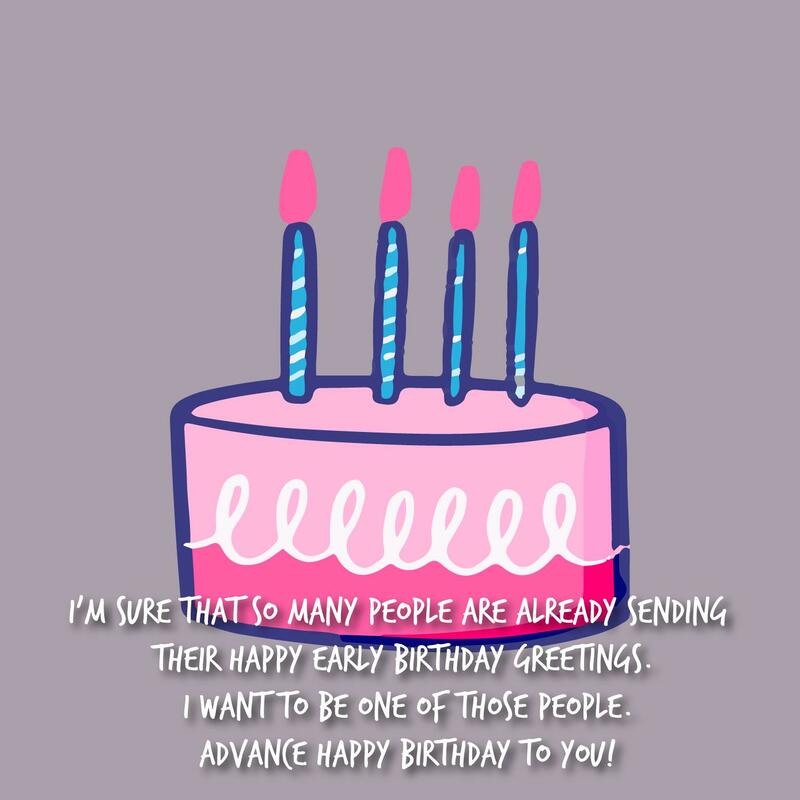 Let me have this opportunity to greet you a happy birthday in advance before this birthday greeting will be overlooked due to many wishes you’ll receive on your special day. Have a wonderful time!